John C. Bogle, Founder of The Vanguard Group, Inc., President of the Bogle Financial Markets Research Center, and, most famously, father of the index fund, hardly needs an introduction. What I can say was that when I first met him, he immediately insisted I call him “Jack,” to which I instinctively countered, “Call me Chris.” Jack exudes vibrant sincerity in his enthusiasm to help the everyday investor. While never afraid to promote his favorite company (Vanguard) and his favorite product (index funds), and with still a hint of competitive juice when it comes to long-time rival (Fidelity), he nonetheless speaks undeniable truths when it comes to some of the awful secrets of the financial industry, and the brokerage/insurance component in particular. Recently I caught up with him in Philadelphia at the Fiduciary Institute’s launch of its “Campaign for Investors” initiative. We followed that up with the formal interview you see here. My conversation with him was deep and extensive. Because of this, and to give you the full flavor and context of the discussion, I’ve done something never done in a FiduciaryNews.com Exclusive Interview: I’ve provided the raw, uncut transcript of our talk. Each question not only focuses on a single topic, but each contains at least one unexpected surprise. FN: Jack, tell us about how you first got interested in the concept of being a fiduciary and what attracted you most to the idea? Then, in particular, I revealed the real problem I had, despite the fact we were a publicly held management company, of public ownership. It got even worse after 1971 for public stockholders because mutual funds and mutual fund management companies started to be bought by financial conglomerates. You got this giant owner who calls the shots. And if he buys a mutual fund management company for, say, a billion dollars, he wants to take out between $150-200 million a year in profits. That’s the return on his investment. It doesn’t work. Probably back in 1971 when I was worried about this – let me guess – there were a dozen mutual fund management companies that were owned by the public. Conglomeration had not really started. But today forty of the fifty largest mutual fund companies are owned by the public. Of that, I think about thirty-five by financial conglomerates and five are publicly held. So the industry has gone in the wrong direction. Ever since it became possible to sell your fiduciary duty – the Supreme Court decision that was made in 1958 (the California court has allowed this to go on and the Supreme Court did not review), we have this industry with an incorrect structure, one that does not work for the investor. That’s where it begins, and I have used the term “fiduciary” or “fiduciary duty” or “fiduciary standard” a number of times in my speeches of which there have been 500 or so. You’ll probably find it in there – let me say – 250 times. FN: Why do you think it took so long for regulators to get on board with the idea of the fiduciary standard? Bogle: Well, first it’s complicated. It’s easy to write. The Department of Labor release must be 150 or 200 pages. It’s complicated. It involves recordkeeping. It involves, at least for stockbrokers, a whole new way of thinking about things. Also, in having come out of the Labor Department – which I salute them for doing… I had a great time with Phyllis Borzi at the Philadelphia event, she’s a wonderful person, a public servant we need everywhere – but the reality is it’s complicated. We used to talk with the executives at the Investment Company Institute and I’d say “We need a federal statute for fiduciary duty” and they’d say “We are fiduciaries.” I would say to them “Are you fiduciaries for the fund shareholders or the management company shareholders? You should go through your ads – an absolute conflict-of-interest!” That will ultimately require this industry to change and change rapidly. There’s no question about that. FN: The DOL recently announced its new Conflict-of-Interest Rule that expands the definition of “Fiduciary” to cover more types of service providers and brings IRA plans under the ERISA umbrella. Why is this important and how do you think the industry will respond. I realize you’re not a lawyer, but do you have any predictions on any of these lawsuits against the DOL? Bogle: Well, you know I spent an awful lot of time on investment company law and fiduciary law with Tamar Frankel, so I wouldn’t fall back on abject ignorance. Sooner or later the law requires interpretation. As I mentioned in Philadelphia, it’s really kind of amusing, the stockbroker who has retirement plan clients on his left hand and non-retirement plan clients on his right hand. Are you really going to treat them differently? In other words, we really should have a rule on fiduciary duty come out of the SEC. It’s just absurd to think your broker is going to handle your retirement account for you in a little red file and your personal account in a file that says “Rip this Guy Off Whenever You Can” in a blue file in the right hand. I don’t think that’s something that’s going to happen. The result of this Labor Department Standard – and Vanguard has said some very good things about it – most of the people in this industry are into this lawsuit thing, they’re speaking… Look, this is a great marketing business, the mutual fund business. I tried to make Vanguard a great fiduciary business but it’s a marketing business. That involves bringing out many new funds – that you would never bring out as a fiduciary – because everybody seems to want them and charging as much as you can to have the resources to bring out the next one and the next one. This is an industry that’s crying out for change. It doesn’t know it is, but it’s going to happen. This fiduciary standard is probably a good turning point. You’ve got plenty of press. The public is more and more aware of it. So I’ve been in favor of it all along. I’ve worked a little bit with the Labor Department and the White House, actually, in the beginning. I did my best to help out along the way. They found that kind of surprising, but I guess what I do is kinda surprising to everybody. FN: Let me ask you, you’ve been talking to a lot of people about this no doubt. I’m thinking more in terms of the mass audience, the retail investor, have you detected any sort of response from them with regards to the DOL’s new Fiduciary Rule? Are they even aware of it? What part of it do they remember? Bogle: I honestly believe that public awareness about the fiduciary standard is extremely low. It’s not a high headline kind of thing. You know, we consumers in the great United States of America have so many things on our mind. We worry about our jobs. We worry about our children. “Can I pay my mortgage?” All those kind of things that interfere with a wide view of the world. Unless something is really sensational – I mean, think of the difference between this, for example, and what went on in Orlando, we saw this big thing on the television all the time, without any new news at all and you can’t miss that – this is easy to miss. But, sooner or later, your own experience as an investor is going to cause you to say – and I hear this from investors every day, but not about the fiduciary standard – “I used to be with Blank, Blank & Blank Brokerage Firm and the best day in my life was the day I walked out on them and sent my money to you.” I’ve probably got hundreds of letters that say that. So investor experience is going to be more important than the knowledge that there’s a change in the weather in terms of the fiduciary standard in my opinion. FN: You know you make me think of the big barrier to that – the SEC’s prohibition of the use of testimonials. What you’re talking about, I can see the ad on TV, but it can’t be used by the industry – for example, Vanguard can’t use it, but an organization like the Fiduciary Institute, they could probably use it. Bogle: When you’re talking about testimonials, you’re talking about papers with a financial orientation – The New York Times, The Wall Street Journal – I don’t think The Philadelphia Inquirer is going to run one. I think testimonials have a very limited impact. I think that a lot of people who thought it was so clever to use Don Knotts – or somebody – with Peter Lynch, or whoever else it was, that didn’t do any good to Fidelity. It probably made them look a little bit like a joke. FN: Speaking of jokes, did you see that John Oliver Show? It went a long way to bringing up the fiduciary issue. Bogle: I have not seen it. Someone told me it was only around 11 minutes [Ed. Note: it’s 19 minutes] but I have not gotten around to it. A very similar experience was that Public Broadcasting piece on retirement plans about three years ago. That runs again and again and again. They had me at my best on that. I mean I was just telling people what it is. They brought in a guy from the JP Morgan fund and he embarrassed himself. The head of the Prudential Funds had the temerity to tell the announcer when the announcer asked “What about the comparison that shows indexing beats active management?” She says, “I’ve never seen a comparison like that.” She’s never seen a comparison like that?! Are you kidding me?! She’s either got to be the biggest moron in the world or a liar. I don’t know which. FN: Actually, you bring up another thought. You mentioned several interesting things in Philadelphia about the active vs. passive debate. You said, in essence, there’s room for both, and this has recently been echoed by several recent articles and in a Morningstar meeting. You said that you don’t see passive going beyond 50% of the market and that there will always be room for active funds under certain circumstances. Can you elaborate on what those circumstances might be? Bogle: I haven’t seen those articles, I’ve got so much to read, Chris. The reality is, the victory of indexing is almost entirely a victory of costs, low costs. Not only low or no advisory fees, low expense ratios, but, don’t forget, no portfolio turnover of any substance and, don’t forget, high tax efficiency, so there are much lower tax costs. There’s no reason an active fund can’t try and duplicate that. It requires them to cut their advisory fees, reduce their transaction costs, and try to take taxes into account in their investment decisions. They can be much more competitive than they are. The chances of picking a winning fund over a decade – let me say just for the heck of it, I don’t have a good number for you but funds go out of business so often it’s hard to do. Half of the funds go out of business every decade. The average portfolio manager only lasts in the business eight years anyway. So if you’re investing for a lifetime, there’s absolutely no question whatsoever that a low cost index fund, which will have the same non-portfolio manager when you’re twenty years old and the same non-portfolio manager when you’re eighty years old – think about that one for a minute – and no new brooms to sweep clean as the old guys come and go. A fund that tries to operate in accordance with those principles will do better than a fund that does not. It would be a real push to say you can buy a [single] fund for which you can invest for a lifetime. Too much change. Too many come and go. Too many portfolio managers go. What is the fund without the portfolio manager in that kind of case? You have to rely on those four principles of cost reduction, which are: operating expenses, no advisory fees, taxes, and portfolio turnover. Those are the pillars. If someone observed them, they would have a fighting chance to win, but not over a lifetime. FN: How does this explain research that appears to show actively managed funds consistently outperform index funds during market downturns? Bogle: When you say actively managed can win in a downturn, well, it would be astonishing that they couldn’t because most active mutual funds carry a cash position of – you know it used to be much larger: 8%, 10%, 12% – but in recent years it’s been more like 3-4%. That helps a little bit in a downturn. And then the index funds, if the downturn is a month, let’s say, you’re savings are not 200 basis points a year, it’s only a month. FN: There have been articles reporting actively managed funds that come close to your four pillars, in particular, the low portfolio turnover/low tax pair. Have you looked at any of those? 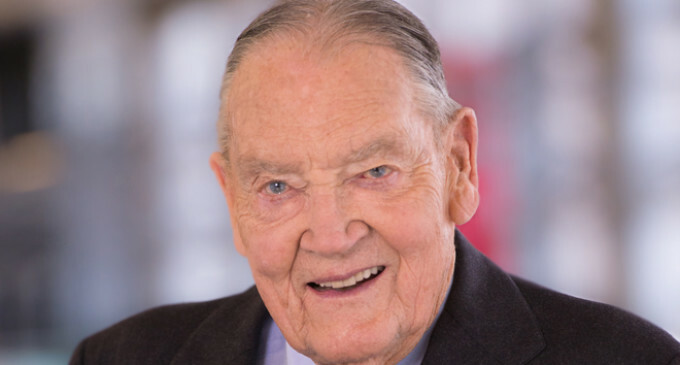 Bogle: In one of my speeches now in a book, I think it’s Don’t Count on It, it has the Alpha Fund – the original fund type – compared to the Omega Fund – the final type, the index fund. The perfect example is the one I think you’re citing. The Mass Investors Trust started in 1924, it looks like a Dow Jones Average, S&P Index, and it doesn’t lose by very much – maybe a point a year, very good. When you look at it over its lifetime, maybe 85 now 92 years, its return is about half of the market return of the period. It’s those little differences in cost over the fund’s long, long, long lifetime that eat away your returns so gradually it’s like a Chinese Water Torture. Just a little bit at time. That’s the example. It’s in that book Don’t Count on It. FN: Let’s talk about something completely different but eminently practical as well as underreported. As you may or may not know, I’ve been writing regularly about this concept I call a “Child IRA.” It’s only available to those few children who earn income. What if there was a way to broaden its availability? What do you think can and should be done to encourage parents to discover how to establish IRA funds for their children? How important is that? Bogle: As I was saying to our group the other day, I have this statement, and maybe it belongs to someone else, too, “time is your friend, impulse is your enemy.” Let me draw you a chart in front of your eyes. If you start at age 1 or zero – just as you’re born – and take that curve out to 85 or maybe 90 is a better one, or maybe to your retirement age, say, 65 or 70, this slope is maybe 45 degrees as it builds. If you start at age 50, that slope is almost straight up. In other words, you might want to contrast $1,000 a year for 65 years with $5,000 for 40 years and God-knows-what-it-would-be for 10 years. The longer you wait, the steeper the slope. It’s pretty easy to realize. FN: Thank you very much Jack for taking the time from your busy schedule to share your experience and thoughts with our readers. I’m sure they’ve learned something new from any one of our points of discussion. It’s always a pleasure to exchanges ideas with someone as vigorous as yourself. Excellent points Jack! Great fan of your exemplary mission on Wall Street and very happy investor in Vanguard mutual funds. “Child IRA” Jack……..you are a genius! How come no one thought about this concept earlier?